Published: April 14, 2019 11:00 Samar Khouri, Special to tabloid! In 2013, BTS was undervalued for being signed to a relatively small label and for taking a non-traditional path in tackling personal and relatable topics in the squeaky-clean K-Pop industry. Today, the act is the most-talked about group and is taking over the world. After concluding their ‘Love Yourself’ album trilogy last year, the K-Pop kings marked the beginning of a new chapter with the worldwide release of ‘Map of The Soul: Persona’ on Friday. The seven-member band’s eagerly awaited seven-track EP, which is the most pre-ordered — 3 million copies — and star-studded one yet, is a nod to the band’s 2014 selves, while showcasing a more mature side and a newfound understanding of love and the outside world. The EP explores a variety of sounds and styles. It starts off with a reflective solo piece ‘Intro: Persona’ by member RM, who asks the fundamental question: ‘Who am I?’ as he explores his identity and references the theories of Swiss psychiatry pioneer Carl Jung. Grammy-nominated singer Halsey lends her airy vocals in electro-pop title track ‘Boy With Luv’, which parallels their 2014 teen anthem, ‘Boy In Luv’. The third track ‘Mikrokosmos’, (a play on the word ‘microcosms’) leads into ‘Make It Right’, co-written by British singer-songwriter Ed Sheeran. ‘Home’ is an old-school song dedicated to fans while ‘Jamais Vu’ is sung by three members — Jin, J-Hope and Jungkook. The album ends with dynamic rock number ‘Dionysus’. BTS has cultivated a devoted following across the globe, as seen on the international iTunes charts. The album and its title track swept the music charts in 86 countries and 67 countries, respectively. The K-Pop act is no stranger to demolishing the UAE iTunes charts. 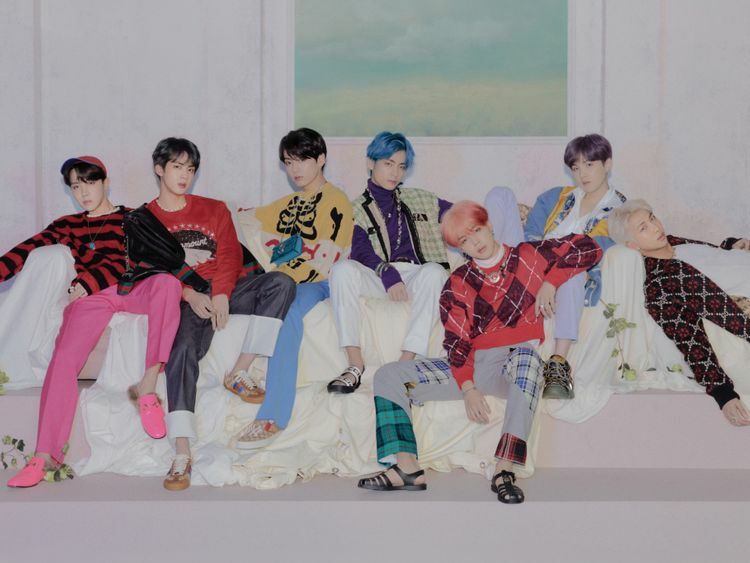 With the help of their massive local fanbase, ‘Map of the Soul: Persona’ skyrocketed to the top of the local Top Albums chart. The group’s ‘Boy With Luv’ (ft Halsey) not only conquered the real-time music charts of six major online music streaming sites in Korea just two hours after its release, it also took the top spot on the local iTunes Top Songs charts. The remaining six tracks also took the top 10 spots. “The whole album really felt like a love letter to us ARMY. It truly made me emotional. Yesterday [Friday] was just amazing; it’s really a special experience to be able to enjoy this with such a great community of fans,” @inglouriousjaen tweeted. Other fans also tweeted that they can sense BTS’s love for their fans in their new music, how the album is “purely BTS in their truest form” and is full of different musical sounds yet delivering the same message and more. BTS shattered YouTube record for views accrued in 24 hours with the ‘Boy With Luv’ music video, which pays homage to 1952 iconic American musical film ‘Singing in the Rain’. It is now the most-viewed 24-hour debut in YouTube history, the video-sharing website confirmed on Twitter.